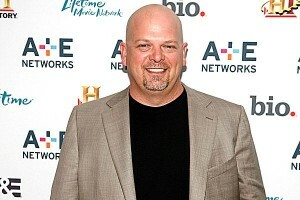 Rick Harrison is an American pawn shop owner and a TV personality with a net worth of $8 million. He is one of the co-founders of the Gold and Silver Pawn Shop. He is featured on a reality TV series, Pawn Stars, telecasted on the History Channel. Rick was born in 1965, Las Vegas, Nevada. Rick began running a pawn shop along with his father Richard “Old Man” Harrison, at the age of 13. He dropped out high school during tenth grade in order to make $2,000 weekly by selling fake Gucci bags. In 1989, Rick and his father opened Gold and Silver Pawn Shop in Las Vegas. In 2005, they started lending about $3 million annually. In turn, they earned an interest income of $700,000. In 2006, Rick was known to have special sports items with a story, such as 2001 New England Patriots Super Bowl ring, which belonged to American football cornerback Brock Williams. In 2010, many jewellery items were brought into the store. Harrison possesses a single family residence in Las Vegas, Nevada. It was bought in 1998 for $85,000. It has a living space of 3,932-square feet, 1 half bathroom, 4 full bathrooms, and 4 bedrooms. The current value of the property is estimated to be $256,411. The Silver and Gold Pawn Shop in Las Vegas is the world famous shop, and it has earned a huge profit for Rick. Pawn Stars, featuring Rick Harrison, is the no. 1 and highest rated show on the History Channel. With David Letterman, he was also featured on the ‘The Late Night Show’, as a guest. In 2012, he also made an appearance as an antique store owner in a show, called ‘The Middle. Apart from being a pawn shop owner, Rick has also written a biography, named ‘License to Pawn: Deals, Steals and My Life at the Gold $ Silver’. In 2011, it was listed at #22 on the New York Times’ “Best Seller” list. In 2011, Rick Harrison was honoured with ‘National Pawnbroker of the Year Award’ by National Pawnbrokers Association for his contributions to the pawn industry. Clark County Commission has declared July 17 as the “Pawn Stars/Gold and Silver Pawn Day”.